This post is a continuation of my previous post Playing Games With One Hand. The setup described in that post works great for PC games, but it is useless if you want to play console games. In order to do that, you need a way to connect the PC to the console and emulate a controller. After searching for a bit, I found a product that can do that, called the Titan One. This little device allows you to use different controllers with different consoles, and most importantly, keyboard/mouse via the MaxAim DI plugin. The MaxAim DI plugin maps keyboard and mouse (buttons and movement) input to buttons on a controller. When you plug the program cable into the PC, the virtual controller is able to send input to the console. It supports many controller types. I am using this with a Nintendo Switch, which requires a little bit of setup. First, since this is a wired device, the System Settings > Controllers and Sensors > Pro Controller Wired Communication setting must be enabled. I am using the XBox 360 controller layout in the MaxAim DI plugin. So far I have been playing Super Mario Odyssey fairly effectively. This device works very well. I also tried the Pokémon: Let’s Go Demo, but found out the game doesn’t support the Pro Controller, so that doesn’t work. I can’t comment on any other games or consoles yet, but maybe I will update this post after I try more of them. I decided to try to learn how to create animated videos. So, I got a subscription to the Adobe Creative Cloud and Skillshare to learn via video tutorials. I also bought a condenser microphone for recording dialog. After watching a few classes, I started working on the first video. The YouTube channel is called VideoStove. You can find a link to it on the amazing website I created for it. Anyway, that is what I have been spending my time on lately. Enjoy! Due to lack of public interest and to make room for other projects, I decided to stop active development on Flavordex and Word64. The apps will still receive bug fixes and my other project, Elementary, will still continue. These products never took off. They don’t have the number of users to justify the time and effort required to continue development. I would like to use that time to work on some other project, as soon as I figure out what that is. Over the past few years, my left hand has become pretty much useless for using the keyboard. This made playing most games impossible, or at least that’s what I thought. For a while I could only play games that only require a mouse. I recently discovered that some people have been able to effectively play most games using face and head movements. The software uses a Microsoft Kinect sensor to recognize facial expressions and head orientations and translates them into keyboard and mouse inputs. I ordered the Kinect and an adapter for the PC. I combined the KinesicMouse software with VAC System (software that triggers inputs based on voice phrases) for the less time sensitive inputs. With some practice I have been able to effectively play games like Minecraft, Battlefield, and Overwatch with just a mouse and my face. Check out word64.com if you are interested. Right now the game is only available on Android via Google Play, but that may change in the future. The app is free with an optional paid upgrade to remove ads. The idea for the name actually came first and the game was designed around that. 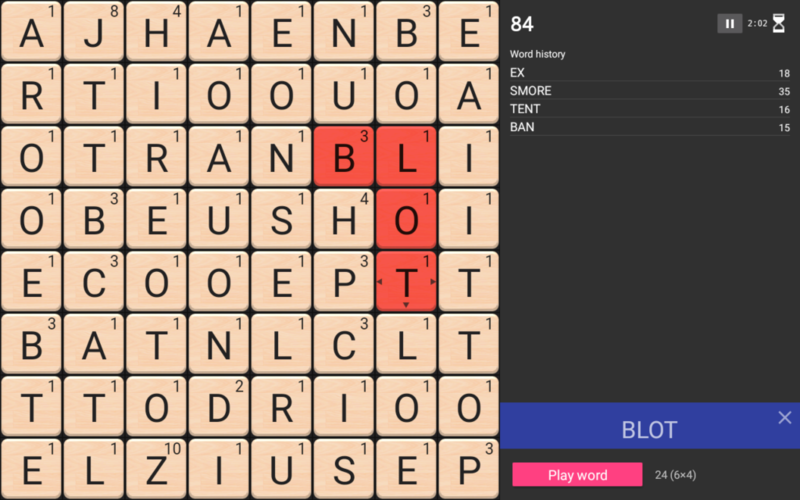 The letter scores and distribution are based on Scrabble, and the game is pretty similar to Boggle. Since my mobile apps weren’t selling, I decided to make them free and release the source code under an open-source license. The code for Flavordex as well as several other projects are available on GitHub under the terms of the MIT License. All are welcome to use or contribute to these projects. I’ve been pretty busy since the last post here. I finally released Flavordex 2 on Google Play and the Amazon Appstore. I also made the first major update to the app today, adding data synchronization among a few other fixes and improvements. UltraMega Software is no longer just the name of my website. I registered the name as a fictitious business name, so I guess it’s now more real or something. I also had to get a PO box since Google Play requires a physical address on all store listing pages and I don’t want my home address made so public. I also reestablished the UltraMega Facebook and Google Plus pages which, along with Twitter, is where I will be posting about app updates and stuff. A few months ago I wanted to check out Android Studio for developing Android apps. I’ve been using NetBeans with a third-party plugin to make my apps. The best way to learn a new development environment is to start a new project, so I decided to start work on a complete rewrite of Flavordex. It’s getting close to being ready for release. It just needs some polishing. Here’s a little preview of the app on a tablet. Android Studio is definitely a huge improvement in the development process. Everything is integrated into the environment and it just works. I’ve also converted my existing projects. 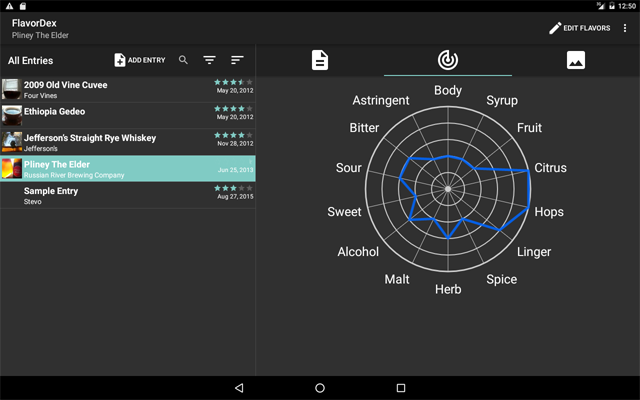 After a long period of almost no sales, I decided to make the Flavordex Android app free. As expected, the number of installs has increased significantly. I do not yet have a plan for how the app will support itself financially. I’ll figure that out if the app becomes popular. The backend is hosted on my own server, which I use for many purposes. The photos are hosted on Amazon Web Services, so that cost will scale with use. Right now it falls under the free tier limit, so its cost is 0 until that runs out. I don’t want to put ads into the app, but I might put them on the website if there is enough traffic. Another possibility is to accept donations from the users.